Having successfully engineered the Balkan crisis with the assassination of Archduke Franz Ferdinand, Jonas set his sights on de-stabilizing the Russian constitution. "Those Russians are so poor they still cover their windows with paper!" he would shout angrily to himself. "Peasants!" Working through a series of middle-men he made contact with, and fomented anti-Tsarist sentiment within, a young Muscovite glazier named Vladimir Ilich Ulyanov. 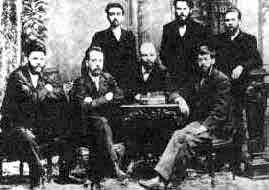 Ulyanov (right, seated, centre) was the perfect puppet for Jonas' scheme: a small and strangely-shaped man, he was frustrated by a lack of promotion prospects within the Russian glazing fraternity. In his fifteen-year career, the largest piece of glass he had been allowed to install was only 8 centimetres square. "I can do more," he would scream at passers-by. But what began simply as the formation of a glazier's union with demands for larger commissions, by 1917 had transformed into something altogether more sinister. Vladimir accompanied the Bolsheviks during their latter days of revolution and by crying: "Mind the glass!" at regular intervals, was able to ensure that not a pane was broken in the storming of the Winter Palace. Details of the next stage of Selman-Troytt foreign expansion.